Today's small businesses are tomorrow's big businesses. 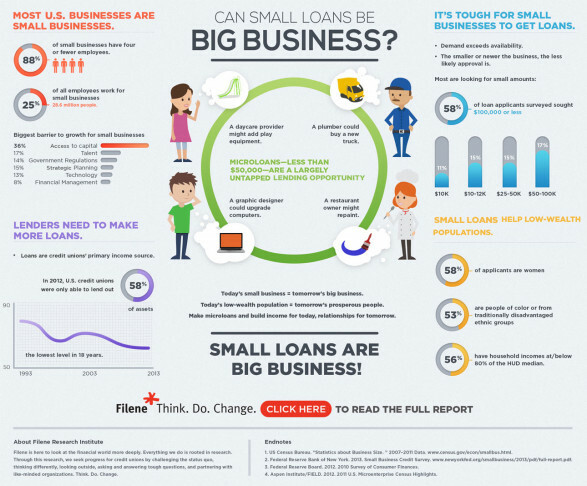 Your loan to a small business owner can not only keep that person in business now, but be the foundation of a lasting relationship as the business grows and prospers. Small business owners often struggle to obtain credit from large banks, and there are fewer and fewer community banks around to fill these borrowing needs. This research illuminates market conditions, borrower demand, and lending characteristics that suggest microloans and credit unions might be well suited to one another. In the report, international microfinance expert Dave Grace—a small business owner himself and former senior vice president of WOCCU—examines the opportunity for US credit unions to form lasting partnerships with small business owners and help their businesses grow through microlending. Grace’s report provides specific research and points of reference for three credit unions: The Queen’s Federal Credit Union of Honolulu, Hawaii; Aloha Federal Credit Union of Honolulu, Hawaii; and JetStream Federal Credit Union of Miami Lakes, Florida. The national trends discussed and the insights into these three institutions provide useful information for the broader credit union system.